Long day helping at the brewery. I came home to a nice bowl of soup and dug into the back of the fridge for that jar of pickles I bought last fall when Paul went moose hunting (Paul is not a fan of pickles). 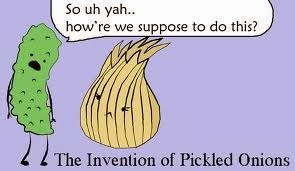 I found one pickle left and half a dozen onions. Well .... down the hatch for the cause, recycled the jar ... and that's that (finished that is). "Pickles is as pickles does." Vickie Dyck: I never count the onions -- it's a jar of pickles after all, now isn't it? Nicole Laliberte: Love that little comic! I laughed out loud.